The John Lennon Educational Tour Bus presented by Other World Computing (OWC), the premier non-profit 501c3 state-of-the-art mobile production facility that provides hands-on creative experiences to students of all ages, has launched the fifth annual Come Together NYC residency. 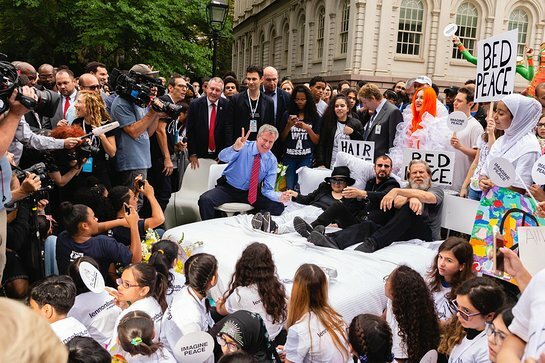 In keeping with this year’s theme of “activism,” this year’s event took place on the steps of New York City Hall with a “Bed-In” that featured Yoko Ono, Ringo Starr, Jeff Bridges, iconic rock photographer Henry Diltz, Mayor Bill de Blasio and local students. The City Hall event marks the start of a month-long Lennon Bus residency and featured remarks by student activists, a group sing-a-long of Give Peace a Chance and Imagine led by Rockaway Beach rock band Blac Rabbit, and fun creative activities for the many students in attendance from NYC schools the Lennon Bus has visited in recent years. “John would be very proud to know that this project encourages young people everywhere to embrace their creativity and share their ideas for peace. 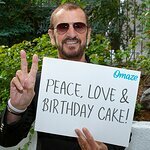 I am so happy to be celebrating its 21st year,” said Yoko Ono. The Lennon Bus streamed the Bed-In so fans around the world could come together with those at City Hall to inspire student activism in honor of John Lennon and Yoko Ono’s legendary non-violent protests in support of world peace. Throughout the month, the Lennon Bus will be making stops at schools across the City, working with a new Lennon Bus curriculum titled, “Come Together,” developed in association with ed-tech start-up Nearpod, to engage students in conversation and creative activities around topics including peace, empathy, immigration and activism. “After years of partnering with Lennon Bus in its educational mission with schools across the U.S., OWC is proud to continue to support the expansion of the John Lennon message,” expressed Founder and CEO of OWC, Larry O’Connor. The NYC initiative has been produced in association with the Lennon Bus’ Presenting Sponsor, OWC, with the support of Congressman Joe Crowley, Mayor Bill de Blasio, Speaker of the NYC Council Corey Johnson, City Council Members Daniel Dromm, Robert Holden, Francisco Moya, Karen Koslowitz, Paul Vallone, Rory Lancman, Mark Levine, Stephen Levin, Donovan Richards, Jimmy Van Bramer and Barry Grodenchik and State Assembly Members Mike DenDekker and Joe Lentol Partners include Sleep Club, Nearpod, Adobe, Yamaha, the Mayor’s Office, the NYC Council, the Department of Cultural Affairs, the NY State Assembly, Securematics, Sonic Wall and Ruckus Networks.